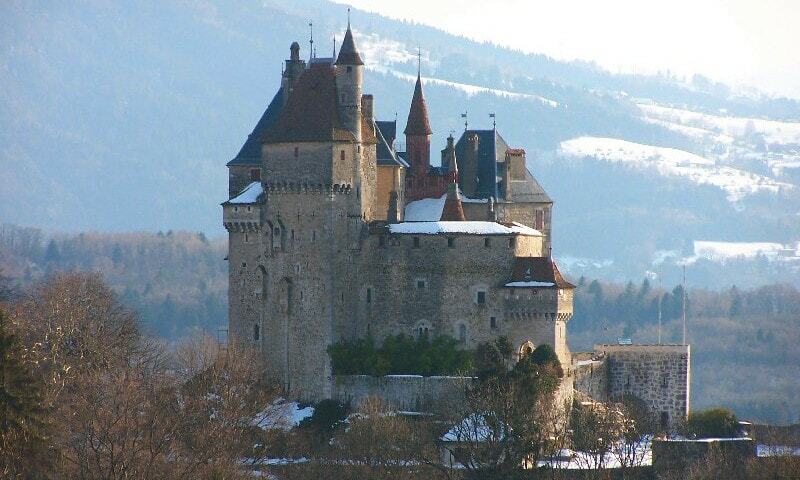 The Castle of Menthon-Saint-Bernard stands on a 200 meters tall rock, commanding majestic views of Lake Annecy and the village of Menthon-Saint-Bernard. It was the birthplace of the legendary Saint Bernard de Menthon, patron saint of all Alpine mountaineers (born in 1008). The castle has been owned by the same family for nearly a thousand years. Evidence suggest that the first fortress on the site was erected in the 10th century; it was a simple wooden watch tower built on a promontory to observe the strategic routes that connected Geneva with Italy as well as the boats on Lake Annecy. From 1180, the castle has been occupied by the Menthon family. Initially, they constructed three high square towers that were linked by round walks; together, they sheltered a big courtyard that was used as a refuge during attacks. 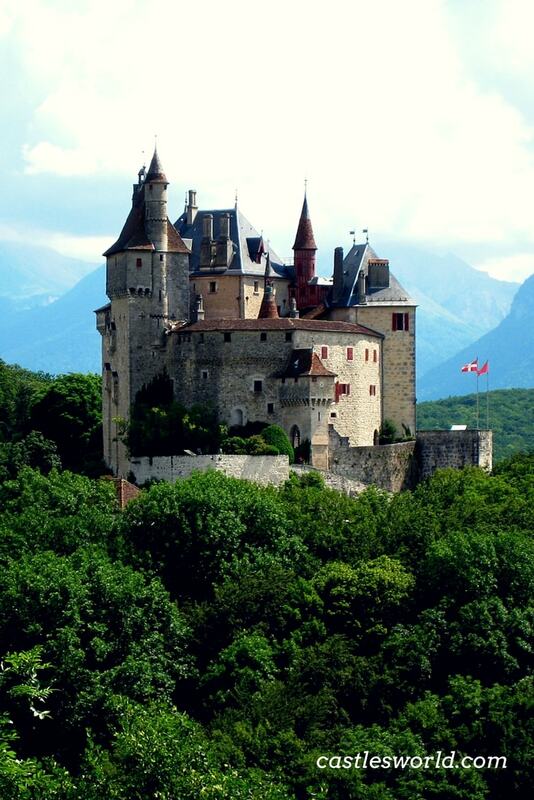 The three towers were utilized as observation points: the Lake Tower looked over Lake Annecy, the Central Keep observed the village and the main road, while the Armory Tower watched over the Pass of Bluffy. A prominent member of the family who lived at the castle in the 15th century was Nicod de Menthon. He was successively ambassador, Governor of Nice and later Admiral of the Naval Fleet sent by the Council of Florence to Constantinople. During the Renaissance, the austere fortress was gradually transformed into a sumptuous residence, used as the seat of the Barony of Menthon. Comfortable apartments took the place of the former sentry walks and the rooms were adorned with decorations and newly acquired furniture. In 1740, a new wing was added, giving magnificent views of the lake from its grand windows. The wing included the dining room and the grand hall of about 100 square meters. In the 19th century, Rene de Menthon, a fervent disciple of the great French architect Eugene Viollet-le-Duc, restyled the entire castle (including the walls, turrets, interior and inner courtyard) giving it the final charm and the overall romantic appearance. When Walt Disney was on holiday in the region, he was so impressed with the castle's new look that he used it as an inspiration for his famous Sleeping Beauty's castle. The castle has 105 rooms on four levels and it is a major tourist attraction. Visitors can admire beautifully furnished rooms, 13th-century kitchens, a library containing more than 12,000 works and the great hall, superbly adorned with pictures and antique furniture. In addition, visitors can discover how a typical Middle Age fortress was gradually transformed into a splendid and elegant castle. Near the castle, the Roc de Chere National Nature Reserve and, on the other side of the lake, the Castle of Annecy.